Thank you to all who attended our Webinar! Factor’s Bram Wessel and Dana Bublitz hosted a free webinar on Enterprise Taxonomy Management on Wednesday April 3. 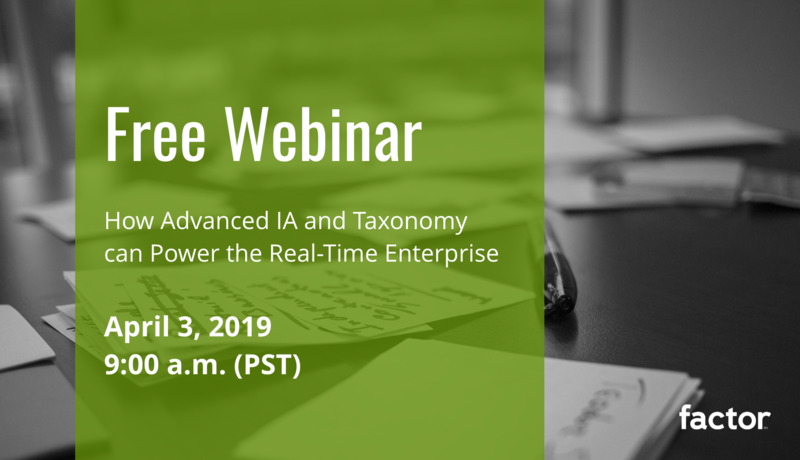 In this webinar, Factor discussed how advanced IA and taxonomies can drive real-time performance analysis and agility at enterprise scale. We talked about how structuring information to drive advanced analytics allows organizations to nimbly adjust to ever-changing business conditions. This webinar was followed by a live Q&A session with Factor. If you missed it or want to share or watch it again, please sign up to view the recording using the form below. We send about one email a month, and we promise not to spam you.